Do you have an instrument such as fiddle, accordion, mandolin, cello, double bass? Want to have fun playing in a group? All ages welcome. All standard accepted with the exception of complete beginners. Must be able to read music (even if a bit rusty). Practices recommence on Thursday 25 August 7.00 - 9.00 pm, Dell Farquharson Centre, Netherton Broad Street, Dunfermline. Contact Gwyneth on 01506 493790 for more details. 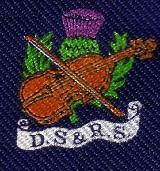 We aim to promote Scottish traditional music. We play for audiences large and small at a range of venues. These range from Care Home settings to Churches, village halls, community centres to The Carnegie Hall and The Rothes Halls. We have our annual fiddlers rally in either August or September, where we are joined by visiting players from around Scotland. In turn some of our members are invited to play at other Fiddler’s rallies. There has been over 100 musicians on stage at a rally, although usually there are approximately 75. Although most of our music is in the Scottish idiom, we also play some Irish and some music from other Genres. If you would like us to play for you, our fees are very reasonable. We can provide either a small, medium or large group of players to make your event a success. Please telephone Gwyneth Young and she will try to accommodate your requirements. No event is too large or small for us.